A new global advertising campaign reveals a tougher side to the puffy man of tires. A new global advertising campaign features a more aggressive role for the Michelin Man. Bibendum's new role is reminiscent of earlier days. NEW YORK (CNNMoney.com) -- The mild-mannered Michelin Man is about to undergo a makeover, emerging as a tire-chucking superhero in a new global advertising campaign launching Tuesday. The French tire company is trying to prove to the world that its tires, which the company readily admits cost more than even "premium" competitors, are more than worth the extra money. To that end, Michelin is launching a $20 million advertising push -- the tire maker says it's the most it's ever spent on an ad campaign -- featuring a very active role for the iconic rubber pitchman. In a fiercely competitive market for replacement tires, Michelin wanted to better capitalize on the character's world-wide fame, said Claire Dorland-Clauzel, Michelin's senior vice-president for communications. "The Michelin Man is very well known," she said. "He's very well liked." 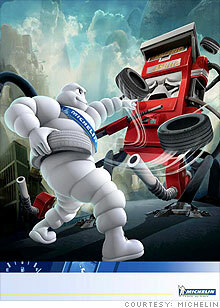 In the ads, the Michelin Man pulls tires from of his own midsection and hurls them, either at drivers who use them to replace their presumably inferior tires or at a frightened, cowering gas pump. The campaign is designed to reinforce the idea that Michelin tires offer better performance while, at the same time, providing better fuel economy and endurance, Dorland-Clauzel said. The Michelin Man's role represents a significant change from the recent past, said Scott Clark, executive vice president of Michelin North America. "He was a more passive endorser of the brand," Clark said. The new campaign is reminiscent of the way Bibendum -- the Michelin Man's "real" name -- was used in early Michelin ads in the early 1900s, Clark said. In those days, Bibendum was often very active in battling competitors. One early ad, in which Bibendum was still made from thin bicycle tires, showed him tossing out tires from his own body, as he does in the new ads. In another early ad, Bibendum played the role of a gladiator standing on the chest of a bloodied competitor with the dead bodies of others littering the ground behind him. In yet another early example, he was seen beating up knife-wielding muggers in a dark alley. The new Michelin Man ads don't go nearly that far. No blood is drawn and no human beings are killed or injured by the jovial tire pile. He is slightly thinner than before, but not enough that most people will notice. The Michelin Man has become too recognizable of an icon to risk major changes to his appearance. First introduced in 1899, the Michelin Man's portly figure was suggested by a stack of Michelin bicycle tires greeting visitors at a 1894 exposition in Lyons, France. The stack of various-sized tires happened, coincidentally, to suggest a human shape. A little later, that idea was combined with an ad layout that had previously been rejected by a Munich beer brewery. The ad featured a portly figure holding up a glass. For Michelin's use, the man in that picture was replaced by the now-famous man made from bike tires. The words spoken by the figure were left unchanged, however: "Nunc est bibendum!" or "Now is the time to drink!" in Latin. In the original Michelin ad, the glass was filled, not with beer, but with nails and road debris. The idea was that these Michelin tires would happily "drink up" all sorts of abuse. Shortly thereafter, the word "Bibendum" became the Michelin Man's official name. Bibendum was white because, at the turn of the century, most tires were the color of natural rubber, a sort of creamy white. Decades later, tire manufacturers added carbon black to the rubber to make it tougher and to provide better traction, but Bibendum retained his original light hue. 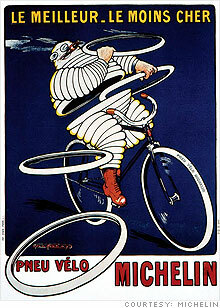 Over the years, the tires making up Bibendum's body became fewer and wider, more like car tires than bicycle tires. In 1998, on his 100th anniversary, Bibendum was the subject of a relatively mild makeover that slimmed him down a bit. In this latest campaign, he is a bit slimmer, still, but not enough that most people will notice the difference. Changes like this have to be subtle, said Rohit Deshpande, a professor of marketing at the Harvard Business School, because Michelin doesn't want to risk alienating those who know and love the big rubber-ribbed character. "You want one foot in the future," he said. "But you can't disregard the past."